I almost never watch television or sit around without something to do with my hands. Crochet, tatting, needlework, etc. I have even been known to do needlework in church and in choir practice depending on my deadline! Are you kidding me??? I never ever take a chance that I might have to sit someplace for more than 30 minutes without my knitting. If anyone has a problem with it, the problem is theirs…they probably don’t know how to knit! I *always* have some sort of handwork project with me. When I’m in a group setting I let people know that I’ll actually be able to pay *more* attention to the conversation if my hands are busy. I don’t know if it’s undiagnosed ADD or just productive multitasking, but just sitting and talking makes my mind wander. I always bring along mindless projects for those chatting-in-a-group times so I can really focus on the conversation and not on the stitch count. I’m excited to read the responses to this post … what an interesting topic. It wasn’t so long ago that everyone knew the phrase “idle hands are the devil’s workshop (or “tools”),” right? With the advent of easily manufactured and affordable goods, I think people over time have forgotten what every evening was like in homes throughout the world before then: noone sat and chatted idly–it wasted precious time, candle and/or lamp light, and hours. i think it’s hard for many people to wrap their brains around having the ability to work with your hands and still be mentally engaged since it’s no longer a part of their daily lives, or even their parents’ lives. I pretty much always have some knitting with me — for the commute, hanging out with friends, even poker games! I have had a couple of non-knitting friends make snide comments (you’re not paying enough attention to me while I’m whining about my ex/my kids/my job!) but mostly people just want to kniow what I’m working on and wish they knew how to knit, too. Disclaimer: I do not knit. I have tried but my hands have a mind of their own. Soooo…as a non-knitter who has immense respect for someone who can knit, I am just realizing I have mixed feelings about someone knitting when they are attending a function which requires even casual conversation or attention. My mom brings her knitting when she visits but she’s family…not a guest. That doesn’t bother me…and I enjoy seeing what she’s working on. I don’t care if people knit at their kids baseball game or in a waiting room or on a train…basically, when they are in their own little world. But…hypothetically, if I were to have a book group meeting at my house, I don’t think I would want someone sitting there knitting. It makes me feel like they would rather be…knitting…than be part of the group. I understand they can multitask but from where I sit…they are telling me they refuse to make a choice between knitting & book group. To me, it’s the same as someone chatting on their computer or texting during a group activity. Yes…I can text and socialize at the same time…but I only do that in an emergency. Anyhow, I think this is a fun conversation…and I don’t even mind if you are knitting when you’re reading my response. I think knitting in public is totally acceptable. I do it on the bus (unless it’s too crowded and there is no elbow room). I do also do it when I’m hanging out chatting. It makes me listen instead of chattering the whole time. But i wouldn’t do it at a restaurant or occasion/party. Just casual hanging out. What a great topic! I am so with you on the RSVPs! Drives me nuts. I don’t knit much, but do hand applique in public sometimes. Generally, I do it when I am with close friends or family or in a large group where it won’t be distracting to others. The bus/train/coffee shop/doctor’s office are definitely OK. I think most people who knit or do other handwork are not offended by other people knitting. In a small group, you can always ask and judge by how they respond whether it will bother them or not. I’m with you on the RSVP & don’t get me started on how/when/where people use their cell phones & what they are talking about! This is my first comment, but I went back & read each & every one of your posts! I have one question/request. Do you clients ever send you photos of their quilts insitu? I would love to see people living with them. I have sewn bindings during discussion groups, but only for gifts for people in the group and not every week, so they wouldn’t think it rude. I did grow up with aunts doing cross stitch around the campfire, though (in daylight) and during conversation so I hardly find it rude. I’ve knit since I was about 8 years old–my first project was a doll blanket. From long practice, I can readily knit a simple stitch without looking, which I am grateful for. In high school, I knit in my classes (ended in college when one teacher asked me to stop). Now I knit at meetings–it helps me gather my thoughts before speaking, and to stay quiet when it’s better I not speak–and I get the pleasure of making something too! I look people in the eye from time to time, so they know that I’m paying attention. I also keep the knitting under the table, so it’s not distracting to others. I tried bringing applique for a meeting or two, but that one has to look at. 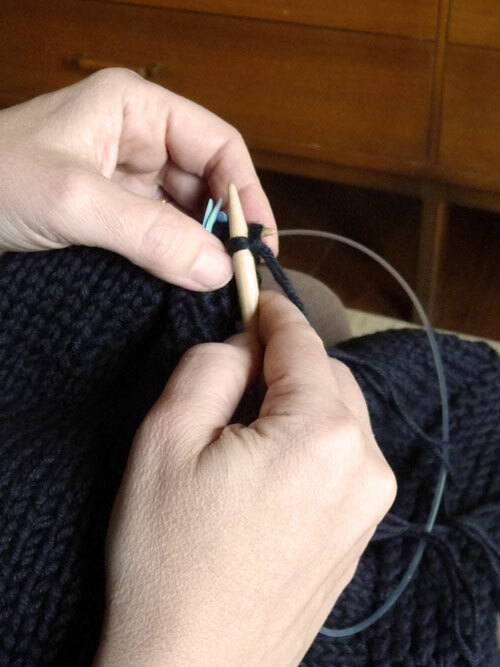 My knitting may bother some people, but no one has ever said anything, and it’s too important to my mental well-being for me to stop–even while I know some people might prefer that I do. But if I’m running a meeting, I don’t knit–takes too much else to keep track of then. I’m a college professor, and though I don’t have many students who knit in class, I don’t have a problem with those that do. I always ask them about what they’re making and tell them that I’m a knitter too. I know that knitting bothers some of my colleagues, both men and women, and that faculty members who knit are generally tolerant of students who knit in class. I usually have multiple had projects going at once, and I always have a project I refer to as “movie knitting:” something very simple I can knit in a darkened movie theatre. I don’t knit in many social situations, but I have knitted at a few long and/or informal departmental meetings. Not a knitter myself but I really have trouble understanding why people would be offended. Texting, talking on your cell phone, playing a game on your cell phone–those are distracting. You’re actually looking at a little screen. Most people I know who knit can do it without really thinking too much, and we have conversations like normal people do. In college my roommate knit in class all the time, and all through medical school as well. She participated in discussions and did well. Situations where I would be averse to knitting–probably religious services, couples therapy sessions maybe, a staff meeting? Anything else is fine. Earlier this month, at the Association of Women Surgeons Annual Meeting, I spotted a surgeon knitting. During a break in the scientific presentations, I turned around to find a fellow attendee working on a beautiful black lace piece. This was a first for me as I had heard of other surgeon knitters but not actually met a public surgeon knitter. She told me that she was once on a committee where her colleagues commented that they knew she felt comfortable in the group because she pulled out her knitting. I , too, was raised to believe that good manners were everything. But as an adult I have decided that I get to decide how I will act. I will always be nice to my elders, sit up straight at the dinner table, say please and thank you, and generally treat people as I would like to be treated. What I ask from THEM is to tell me straight up if I am offending them. Otherwise, if I am participating in the conversation while I have knitting in hand, I’m good. PS I spent last night ONE MORE TIME sitting there reading The Modern Quilt Workshop. What a WONDERFUL book. I once attended a church where the pastor’s wife always knitted during church meetings……..
For myself I usually only do handwork in public in situations where I don’t know people, such as waiting rooms. Although, I usually end up being asked about what I’m doing and make new friends! What an interesting conversation. First, I totally identify with being brought up to be so polite that people with different attitudes are infuriating. As for knitting, I never thought of it offending anyone. Still, I probably would agree with the idea that in a less casual and intimate setting, like a book group, class, or meeting, knitting could be considered impolite. Waiting rooms, family settings, etc., are perfect. As for a man being annoyed because a woman seemed to be knitting and wasn’t giving him her full attention, how ironic is that? I often knit in lectures and classes. If it’s a small group I will usually ask the professor if he minds (no one has ever said that they did) and I assure them that it helps to keep me alert and listening to the class, and that I can easily put my work down to take notes if I need to. In larger situations I will make sure I’m sitting somewhere unobtrusive. I’ve found that people will often come and talk to me about my knitting and that it’s an easy way for people to remember me! I can’t imagine people being offended by someone knitting. And if they are, then perhaps they have a problem that they need to deal with. Talking to some one else when someone is talking, cell phones ringing, texting during meetings, outting lipstick on while at the dinner table, – all of these things offend and are perhaps dangerous in certain situations. Knitting is something I do with my hands – when in a class for instance, I would not try to knit a complicated pattern, but I would certainly have no compunction about knitting the scarves I make for the childrens’ orphanages in China. If people have a problem with that, maybe they should go and see the orphanages themselves before they comment. I don’t knit well, but I do crochet in class, and I don’t think any of my teachers are offended. I’m in college, and my time management isn’t always great, so when homework needs to get done, sleep usually gets skimped on. After two weeks of falling asleep in most of my classes, I gave up and brought crocheting, because I think I can learn a whole lot better while awake, even if my hands are busy and my eyes are sometimes distracted, than while asleep. I get it. People tend to listen better when they knit. It’s fine to knit in public, waiting for a bus, at a coffeeshop, etc. But it is RUDE to knit during a big meeting or if you are on an interview panel. Those are 2 examples that I have seen and was embarrassed. I work in a school and was mortified that a member of the school board sat in our meeting and knitted which lead to 2 teachers knitting. Part of being a groown up is learning to sit politely even when it doesn’t suit your needs/interests!! The rest of us do not break out the coloring books or polish silverware. Grow up. It’s rude is to ignore the people around you at a meeting or gathering in favor of amusing yourself in your own little world. It’s established that knitters can attend to and participate in what’s going on around them while they knit. What’s left is that even if it actually helps the knitter pay better attention, some people still interpret knitting as signaling boredom. I’m thinking especially of those who acknowledge that knitting helps some people listen better and yet still label it rude. Knitting disappeared from the public eye when it ceased to be a necessity. Presumably that was when people lost the understanding that knitting was not a sign of inattention. It’s now up to us to bring back this awareness.